Jaden in his very first outfit to go home from the hospital at 5 weeks old. 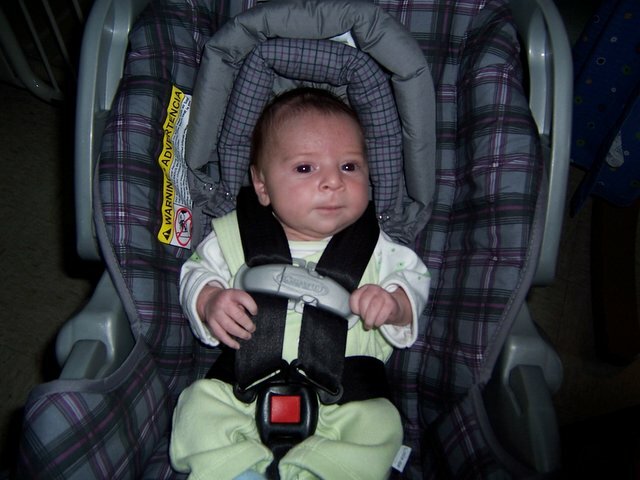 Jaden for the first time in his car seat. Ready to go home!!! 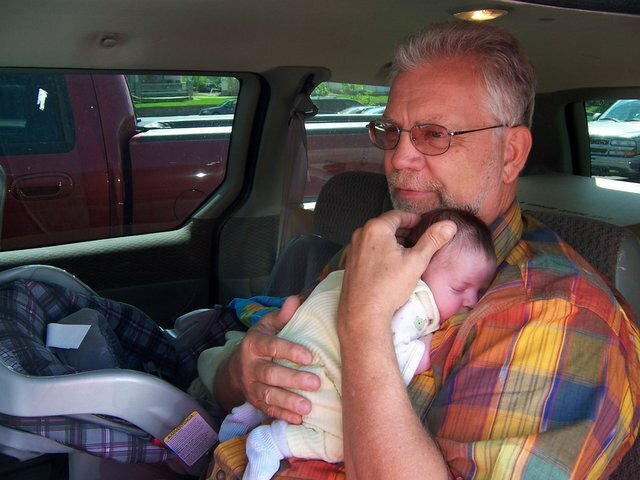 Grandpa calming Jaden down for his car ride home. 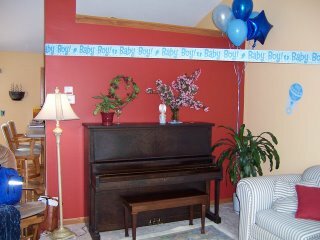 His house was decorated for him to welcome him home. He even had a pin wheel in the front yard with a "it's a boy" sign and a table full of gifts. How sweet are those pictures!! Jaden is just precious! He looks so healthy and content and I'm sure that being home will make such a big difference for all of you! 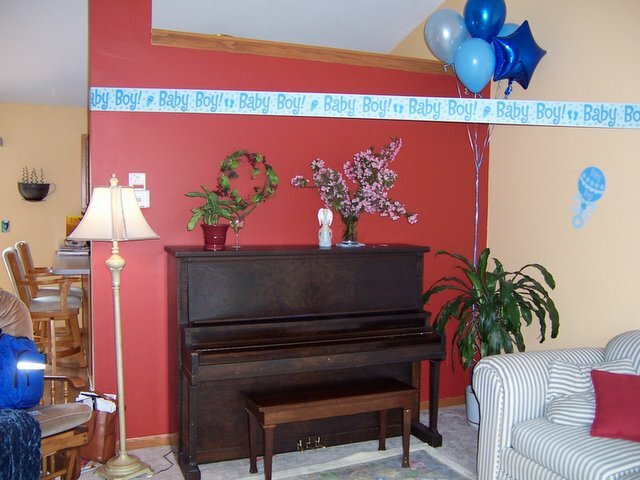 I loved seeing grandma's piano too! You have all shown such tremendous strength through all of this - how lucky he is to have you as parents! Love the pictures, and yes, I'm glad that you and Krista talked me into starting a blog! Thanks again for the flowers - - that was so thoughtful, and I love them! What a precious little guy! He looks great and so do you. That's exactly what I thought! Jaden looks so alert and he is already growing into his features. 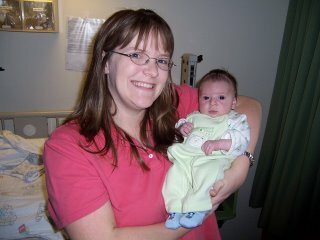 It's amazing how much different he looks with cute baby clothes on instead of white hospital gown potato sacks! Oh, I agree with Steph T.
Jaden looks like Ashley and his Daddy. The pictures are Awesome! Grandpa was a happy camper holding Jaden...I can't wait to hold him ! Talking to you today I could here a more relaxed tone in your voice , being home has to be wonderful for all of you. with lots of love and grace. I need some help planning something special for Mitch's b-day. He keeps erasing it off the calendar and all the while I kept thinking that I was forgetting to write it on there! I always think the same thing about people's ages... just where does the time go!! It reminds me of a song I love to sing for karoke... "I still remember, when 30 was old..."
Good pictures! I told Diane that you put him in the outfit that she gave Jaden. That gave her a great smile. As I mentioned in our family blog, I now have a camera. So hopefully, I can contribute pictures pretty soon. I am bringing it to Ashley's dance recital on Saturday. Yeaaaa!! Yes, I made the blanket. I was going to ship it to RMH the day you went home , so I waited. I didn't want Ashley and Ethan to feel left out so I wanted to send them something in the mail too. It was to have your name, Ethan's and Ashley's. I hope they enjoy the tapes and you the book. I was sure you would screen them before they watched them, or as they did,in case they had any questions. I was not able to do that before I bought them. I did talk to the christain book store and they asured me that they were great. Sounds like we will all be able to go to a lot of activities this summer with the children attending things all summer long. Justin , my daughters oldest son played t-ball, what fun that was for him. He also did Pop Warrener(not sure of the spelling) football. I still have the team shirt... I sponsored his team. They are so little and so so cute! They can learn so many lessons with activities like these. OHHHHHH :) Look at how cute he is!! In the beginning pictures, I could totally see Stephanie, and now I totally see Sal in these. He looks so alert!